Loyalties to fast food French fries run deep. But for all the love they garner, few fast food chains have made attempts to innovate. There’s Wendy’s, which in 2010 switched to a fry made from skin-on Russet potatoes and added sea salt. But that’s about it. Burger King’s chicken fries isn’t even a fry. It seems as if for burger joints, the gutsy menu changes take place between the buns. Enter Taco Bell. More than most of its burger-based competitors, Taco Bell is quick to introduce menu items that vary between the lazy (“If we fold a quesadilla this way now it’s a Stacker!”) and the outright absurd (I’m looking at you, Naked Chicken Chalupa). These dishes aren’t meant to be long-term staples; they feel like empty-caloric shiny objects jangled in our faces to momentarily divert our attention. The introduction of Taco Bell’s Nacho Fries (limited time offer) feels like a particularly ambitious gambit. For years, Taco Bell’s been on their own island, rivaled only by regional chains like Taco John’s or Del Taco. To enter the world of French fries is a pointed stab at their bigger, beefier competitors. While it seems like fool’s errand, Taco Bell has more space in the fried potato game than they lead on. For years, their Fiesta Potatoes have been—in this critic’s opinion—a perfect side dish. The potatoes are lightly battered and fried until they glow radiantly orange, and they’re then placed beneath hearty goops of nacho cheese and sour cream. For one dollar, you get a small container of French fries and cup of nacho cheese dipping sauce. 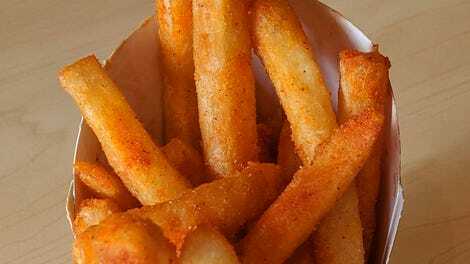 The fries are cut thicker than that of McDonald’s or Burger King, ebbing more toward Wendy’s thicker (and often soggier) offerings, perhaps Arby’s curly fries. Fried gently, the fries retain their shape and offer the slightest snap when bitten, revealing a fluffier inside than one would expect. And they aren’t particularly greasy. What sets the Nacho Fries apart is the seasoning. It’s coated in “Mexican spices”—a description that’s both nondescript and a catchall—which includes garlic, paprika, sugar, onion, salt, aged cayenne red peppers, and vinegar. The spices play well with the potatoes, leaving the lightest spice dusting on your fingers, and creating a flavor that’s distinctly identifiable as Taco Bell. 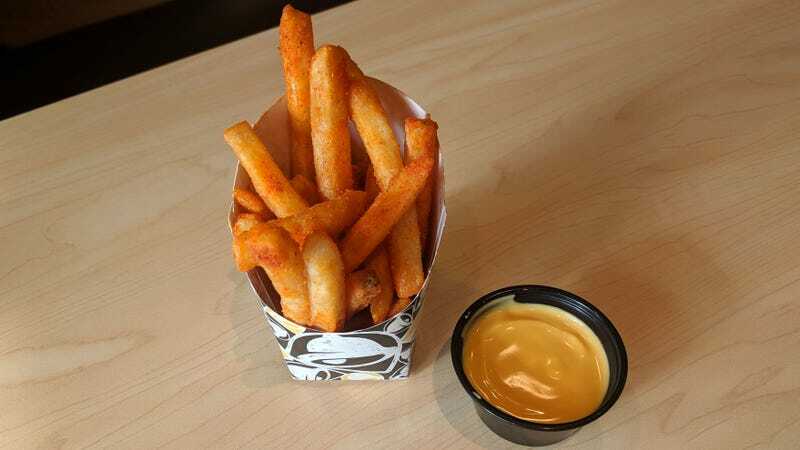 The choice to pair the fries with nacho cheese is wise, as the gooey, mass market ooze balances the spice of the fry itself. Given that the fries are a bit thicker, they are able to withstand a healthier coating of the sauce without sagging under the weight of it. But the coup de grace is, of course, the fact the fries can be added to any menu item, or substituted, for an upcharge. I assumed the smart move would be to order the Cheesy Potato Burrito and sub in the fries for the potatoes, as it felt like the most natural pairing. This was a bad idea, though, as the heat of the cheese and beef turned the fries into a soggy mush, robbing them of both flavor and texture. In a more neutral item—say, a Crunchwrap Supreme—the fries were a welcomed presence. The biggest issue with the Nacho Fries are that, as a standalone item, it feels a little slight, and two orders is too indulgent. The way the seasoning lingers after each bite gives the Nacho Fries the feel of snacking on a bag of potato chips—you want to keep going long after you’ve thrown your head back and inhaled all the crispy remnants trapped at the bottom of the bag. When used as the base layer in their nachos, the flavors naturally meld to one another, making it the most indulgent order of cheese fries you can find on a fast food menu. Though they’re only available for a limited time, the Nacho Fries are the best innovation Taco Bell has made since the introduction of Diablo Sauce (and before that, the Dorito taco shell). It’s something that appears as both a clever marketing and a legitimate innovation within Taco Bell’s arsenal. They may still be fast food fries, but it serves as a challenge to their fast food competitors, too. French fries may not be novel on their own, yet when they’re good, you feel like you want to pledge allegiance. Hey Michael Schur, is a hot dog a sandwich?